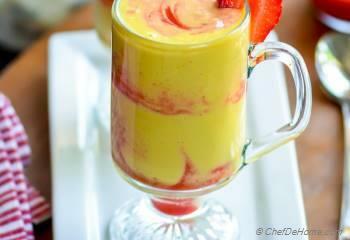 A lite and refreshing, protein-packed yogurt smoothie with flavor of fresh mangoes and swirl of strawberries. Today, I'm sharing a healthy, delicious and gorgeous breakfast smoothie made with Chobani's Non-Fat Greek Yogurt. I hope you all enjoyed the long weekend! Summer might be over but the sun is still shining bright in our sunny California. It was so hot all weekend long.......that we did nothing all three days......just stayed indoor and enjoyed good and lite food! You know, in my family, mango and yogurt base smoothies are a very common lite breakfast. 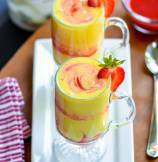 Actually, this smoothie is a gorgeous variation of our favorite, famous "Mango Lassi". But, amazingly, I got to share this recipe with you just now. Greek Yogurt is a delicious way to include vegetarian protein in our daily diet. The best part is, it is a versatile smoothie base which pairs great with fresh fruits to make filling yet healthy smoothies. 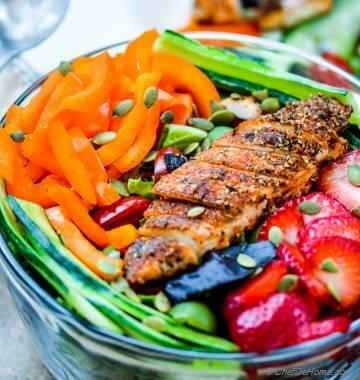 A good serving of protein, live active cultures that help support digestive health, with the bonus of anti-oxidants and flavor of fresh fruits! No carbs… no gluten… and a gorgeous smoothie that is ready in just 10 minutes! How delicious and healthy does that sound? During my recent trip to Ralph's, I picked few extra containers of Chobani Greek Yogurt to include in a few smoothies in our long weekend's lite and quick breakfast menu. Did you know? A healthy scoop of fat free Greek yogurt has twice the protein as regular yogurt and live active cultures that help support digestive health. 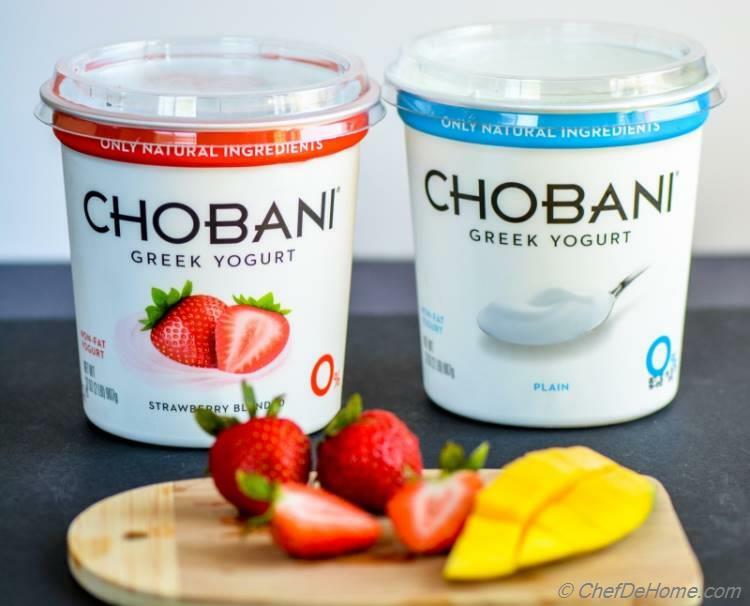 Chobani Non-Fat Greek Yogurt has three types of probiotics, 40% less sugar than regular yogurt and no artificial flavors or sweeteners, and only natural ingredients that are not genetically modified. Also, for this smoothie, I have added no sugar or artificial sweetener. 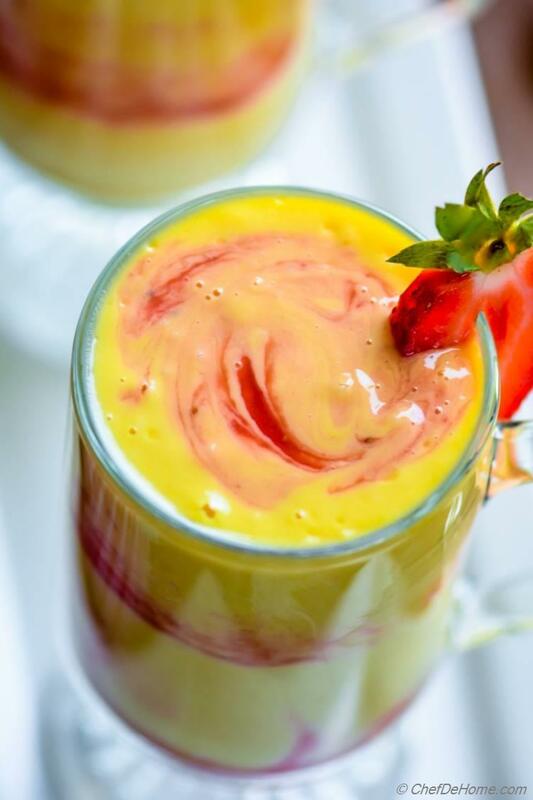 Just natural sweetness of mango and strawberries makes a pleasant tasting smoothie. PS: If you can't find sweet mangoes, then you can add 1-2 tsp of honey or agave syrup to add some sweetness. I'm sure you know, yogurt smoothies are very versatile. I actually even LOVE enjoying this smoothie with just plain non-fat Greek yogurt and fresh mangoes, but feel free to add in any other fresh fruit (raspberries, pineapple, banana etc.) or extra mango if you’d like. If you get creative with smoothies, there are plenty of healthy fresh fruits that you could substitute in for the mango and strawberries. The options are endless! 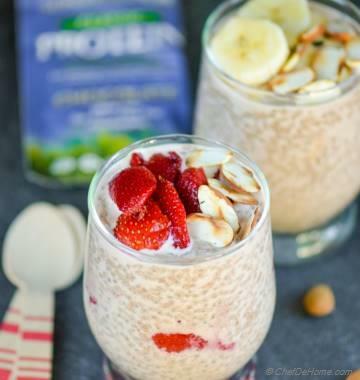 Due to their creamy texture, Greek yogurt smoothies are also great for making smoothie bowls. Like this one, I served with spoons to scoop and enjoy! If you want more thin consistency, consider adding 1/2 cup more water. Friends, while fresh sweet mangoes and juicy strawberries are still in store, go grab some and transform your breakfast to a lite and healthy breakfast drink. Oh- and don't worry if you can't find mangoes, Greek yogurt is a delicious base that goes great with any fresh fruit! Happy Blending! 1. 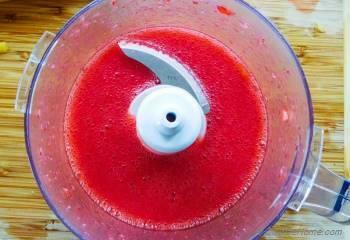 In a food processor jar, add fresh, hulled, 8-10 strawberries with 2 tablespoon of water and make a smooth puree. Remove in a glass and set aside. 2. 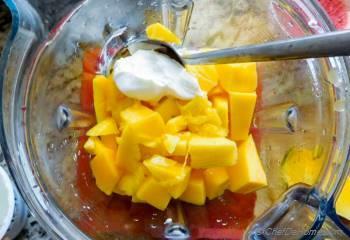 In blender, add Chobani plain greek yogurt, mango pulp, and 1 cup of water. 4. 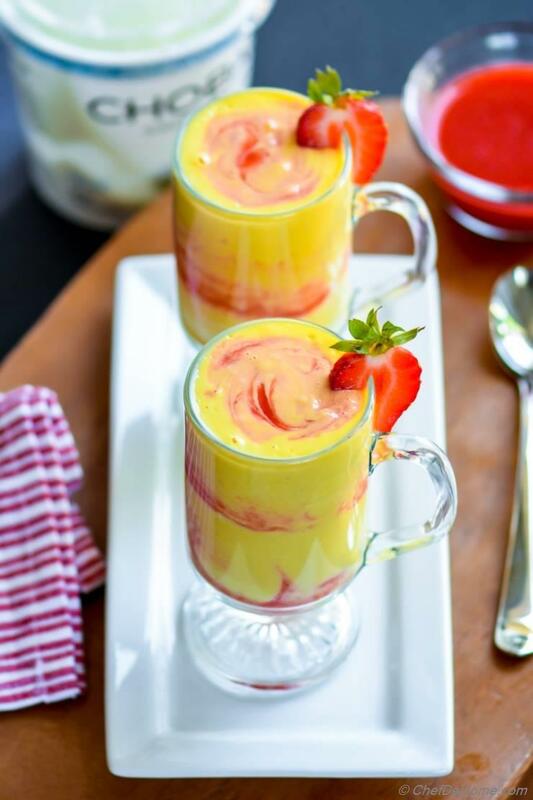 In two glasses, layer mango-yogurt smoothie and strawberry puree (save 1 tbsp) in alternate fashion so as to finish with yogurt layer. Add remaining puree in each glass and swirl with back of a thin stick. Garnish with fresh berry. Serve and enjoy! Use very less water to puree strawberries because a too thin strawberry puree will not swirl and spread on sides of thick yogurt smoothie. Yum yum yum! This looks so delicious and refreshing! 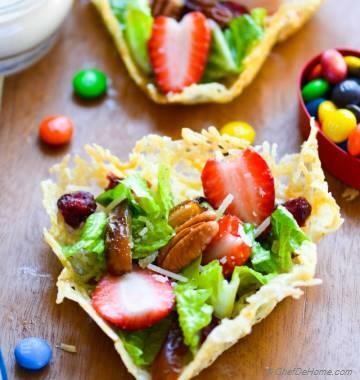 With summer just around the corner here in the Southern Hemisphere, I am so excited to try this soon! Thanks, Gauri! You can even make yogurt smoothie with banana! 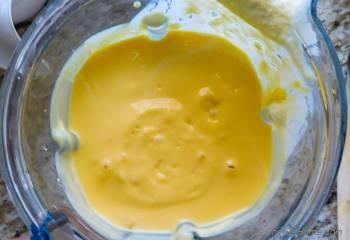 I also sometimes use mango puree when fresh mangoes are not available. Thanks, Kushi! You can two glass! It is very to blend! A must try! Gorgeous Color! Love this pretty smoothie Savita! This smoothie looks awesome! Can't wait to try it! Love the swirl! Thanks, Mira! Strawberry swirl is my favorite too! This just shows that you can get plenty of protein from a smoothie. The mango adds a lovely pop of colour and this looks delicious. Thanks, Dannii! I'm glad you like this smoothie.